Many, many years ago I came across a book with the intriguing title An Eye For a Bird. It was in the photography section of my local library so I took it home. It was written by the No 1 bird photographer of the day – Eric Hosking. By the time I’d finished reading it I had decided that bird photography wasn’t really for me since it involved days of sitting motionless in a hide, and that was only possible after you had located a nest. I thought I’d have a tough time finding a nest never mind getting a hide anywhere near it. However, I like birds (I’ve been a birdwatcher for all my adult life), and I’m a photographer, and birds are colourful attractive creatures so I’ve photographed them in zoos and wildfowl collections, but unless a robin happened to land nearby, almost never in the wild. I was invited for a holiday with my daughter and her fiancé who live on the north coast of Scotland. This is pretty much the middle of nowhere, but incredibly beautiful. I woke up each morning to a view of a sea loch and mountains. Although they didn’t appear while I was there, sea eagles occasionally fly overhead, and otters frequent the shore. Golden eagles are not quite as elusive and wild red deer are in abundance. One day we headed off to a place Duncansby Head. This is the north east corner of the Scottish mainland and a place where, without needing to set foot in a boat, you can get within photographic distance of a noisy gathering of a variety of cliff-nesting birds. 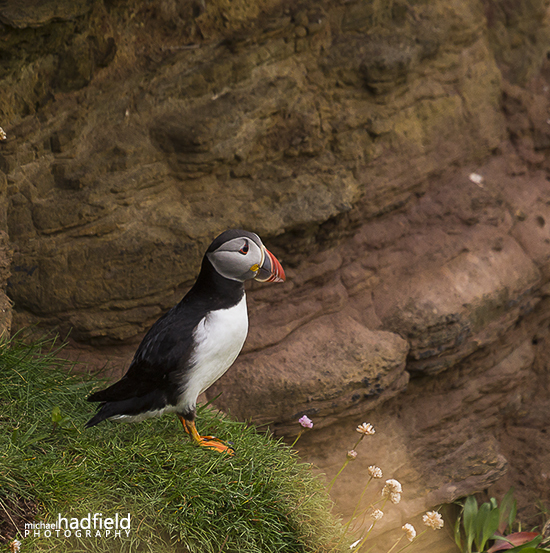 Razorbills and guillemots were present in large numbers, but there were also plenty of fulmars, kittiwakes, and the bird I’d come to photograph – the puffin. 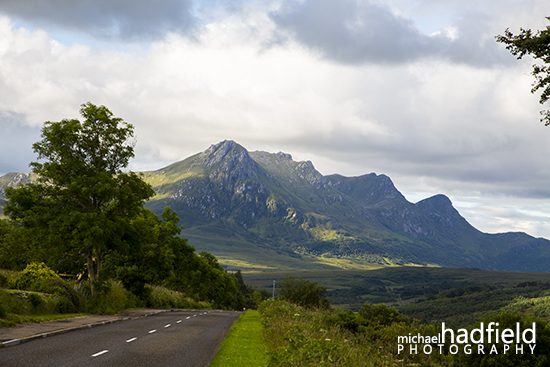 I’d been generously offered the loan of a Canon 100-400mm L lens to use with my Canon 6D. 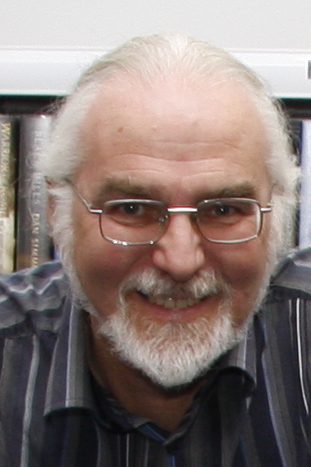 With such a long focal length a tripod is essential – but I was travelling light so I pushed the ISO up to 800 and the shutter to 1/500 and hoped for the best. I would have got slightly better results with a tripod, and next time I visit I will probably take one with me. It was around 6pm but bright sunlight from a clear sky created harsh shadows. Dead grasses on the clifftop and a very strong wind all added to the challenge of coming home with something I’d be pleased with. Even with maximum zoom the birds didn’t fill a lot of the frame, but with the full frame 6D you can crop quite heavily and still end up with a reasonable quality image. The guillemots, razorbills and kittiwakes were a little trickier because they were in total shade. While I was looking through the lens at a handful of razorbills clinging to the edge of a sea stack I was struck by the effect of the slightly out of focus water behind and the slightly disorienting sensation it created. Although I was aware of the sea moving I knew that wouldn’t translate into a still image so I waited for a bird to approach the cliff just to add sense of movement to the image. So you can see that with just a 400mm lens, you don’t need to get too close in order to capture quite acceptable images. 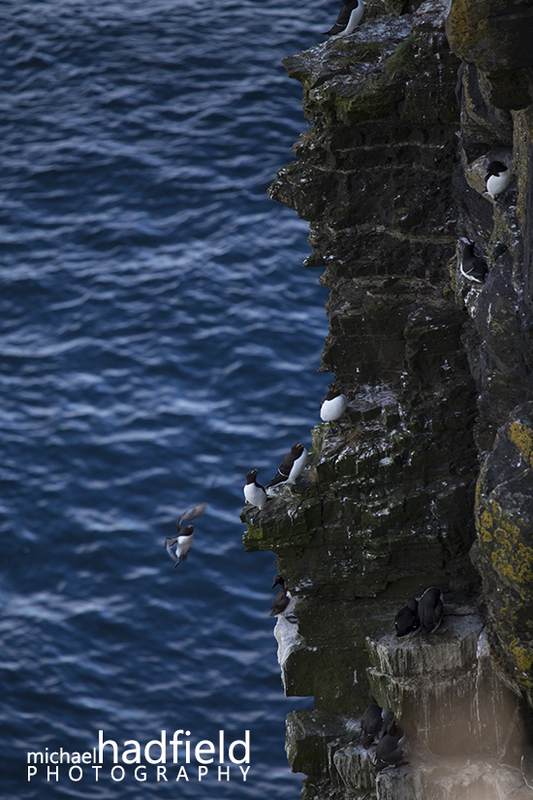 There are plenty of cliffs around the UK that are utilised by sea birds for nesting purposes. 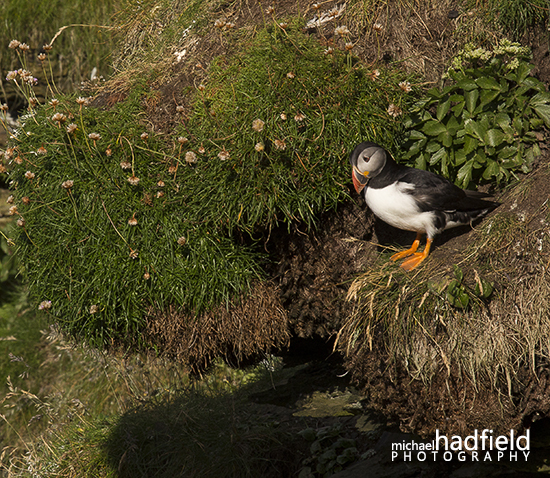 Of the few I’ve visited, Duncansby Head is the only place I’ve been able to get close enough to photograph puffins. This entry was posted on Wednesday, July 30th, 2014 at 8:59 am	and is filed under advice, technique. You can follow any responses to this entry through the RSS 2.0 feed. You can leave a response, or trackback from your own site.